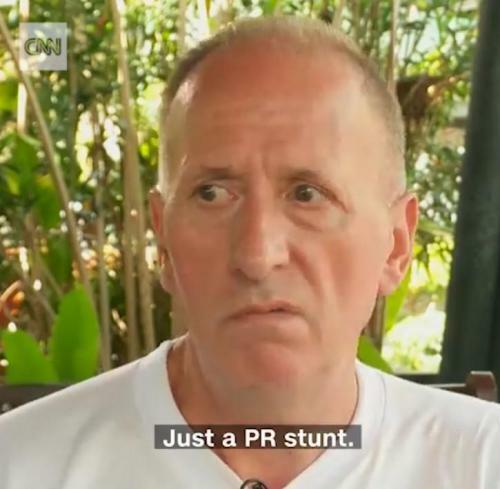 Vern Unsworth was one of the rescuers that helped pull off the miraculous rescue of 12 children and their soccer coach who were trapped in a cave in Thailand after it flooded. The rescue has been passed around international media for the last couple of days as a fantastic “feel good“ story that everybody could get behind. The only person that didn’t seem to get behind the rescue after it was completed was Elon Musk, whose proposed kid size submarine that he shipped to Thailand to help with the rescue was ultimately not used. We reported days ago that Musk instead lashed out at the commander of the rescue operation after he didn't use Musk's idea. Today, stunning statements are being made by one of the individuals involved with the rescue who was interviewed by CNN International. 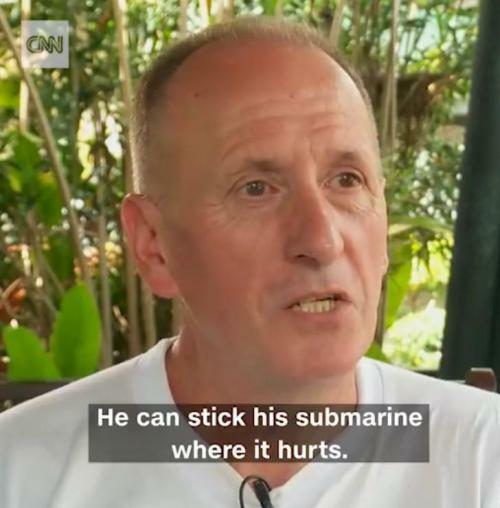 CNN International’s Facebook page posted this interview in which Unsworth said that Elon Musk can stick his submarine - that had "absolutely no chance of working" "where it hurts". He then went on to state what many of us had already been thinking – that the kid size submarine idea was simply just a public relations stunt. In the full video interview, he also goes on to state that Elon didn’t have any idea as to what the caves would be like. He says he had "no conception of what the caves would be like". When the interviewer notes that Elon was there in the Cave area at the time of the rescue, Vern noted that he was then asked to leave very quickly. We reported about Musk lashing out at the rescue commander just days ago after he publicly questioned the authority and expertise of one of the key individuals responsible for successfully navigating the rescue of 12 boys and one soccer coach trapped in a cave in Thailand. As the rescue effort took place over the course of several days and finally, when on Tuesday it was reported that all 12 children and the coach were in fact safe, Musk's "escape pod" wasn’t deployed or used in any fashion. And instead of assuming that "all’s well that ends well" and being happy for the individuals who were rescued, Musk took it upon himself on Tuesday to actually question the authority of one of the joint commanders of the operation. The entrepreneur had offered his help and posted footage of tests being carried out on the apparatus he proposed in recent days. But while Narongsak Osatanakorn, the head of the joint command centre co-ordinating the operation, acknowledged Musk’s offer he said that the mini submarine would not have been practical for the cave rescue. In response, Musk said Osatanakorn was “not the subject matter expert”, adding that he believed he had been “inaccurately described as rescue chief”, and should be more accurately referred to as the “former Thai provincial governor”.